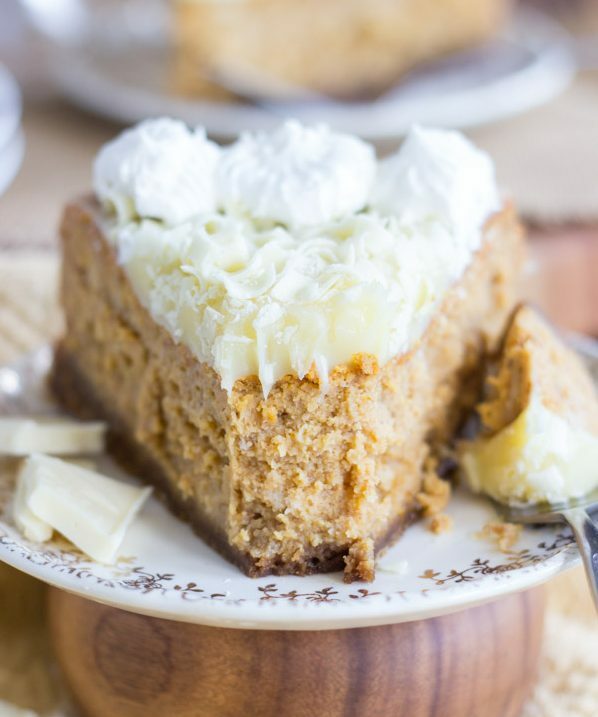 Perfectly rich and creamy spiced pumpkin cheesecake, infused with melted white chocolate, chock-full of white chocolate chips, and with a spicy gingersnap cookie crust! 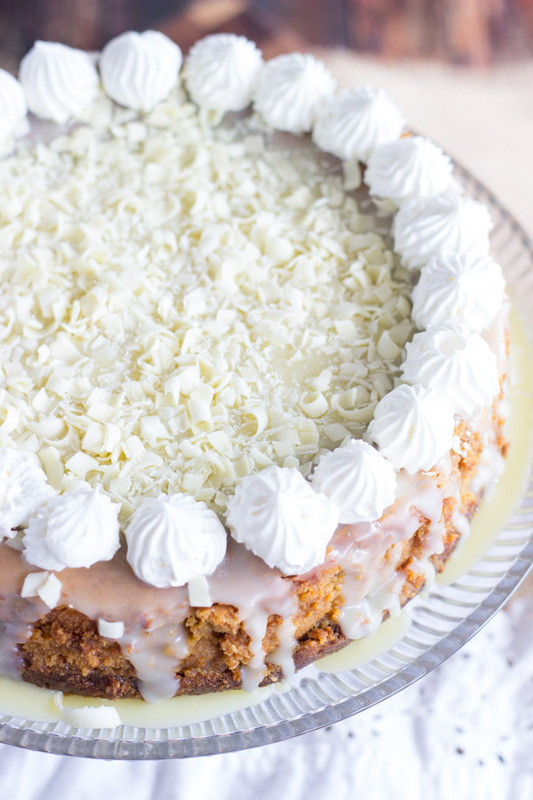 Even more over-the-top, This White Chocolate Pumpkin Cheesecake is drenched in white chocolate ganache! 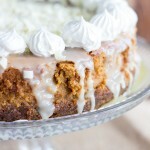 I saw this White Chocolate Pumpkin Cheesecake with Gingersnap Crust playing out a little differently in my head. It’s not quite as pretty as I’d hoped. What is it about white chocolate ganache – it just doesn’t photograph well, I guess? The chocolate curls turned out more like chocolate shards. But not artful and rustic chocolate shards, just little crumbles of chocolate. I was also incredibly rushed when I was piping on the whipped cream. I was so nervous and stressed in the kitchen that day. I was prepping homemade, from-scratch croissants for the first time ever, and they were so time-consuming to make that I was petrified they weren’t going to turn out. I was piping on the whipped cream for this White Chocolate Pumpkin Cheesecake with Gingersnap Crust while the first batch of croissants were in the oven, and the croissants were all I could think about. If they didn’t turn out, I was going to be devastated. Not to be dramatic, but if you’ve ever made homemade croissants, you would relate to this feeling. There’s a lot of steps and time-commitment. The dough takes an eternity and a half to prep, so it would’ve felt like a huge failure if they didn’t work. They did (you can see my Homemade Croissants recipe now! ), but the garnish on this cheesecake suffered a little. Nevertheless, I feel there is no better recipe to kick off fall baking than a pumpkin cheesecake. 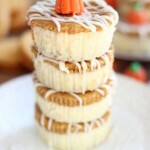 This is my favorite season for baking, and pumpkin cheesecakes are a favorite dessert of mine, so it’s only fitting. 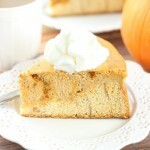 I have several pumpkin cheesecakes on the blog already. 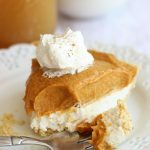 Regular readers will probably recall that this Double Layer Pumpkin Cheesecake is one of my favorite desserts of all-time. I only talk about it constantly. Whenever I take it holiday parties, it gets rave reviews. 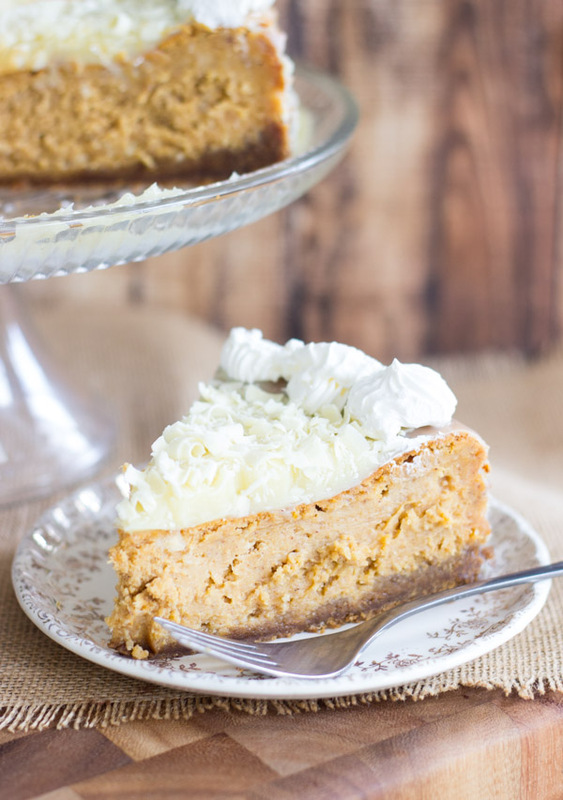 I also have a No-Bake Double Layer Pumpkin Cheesecake version. If you’re looking for a short-cut, quick option, it comes together in 10 minutes. There’s this super-decadent Pumpkin Chocolate Chip Brownie Cheesecake that’s also excellent. 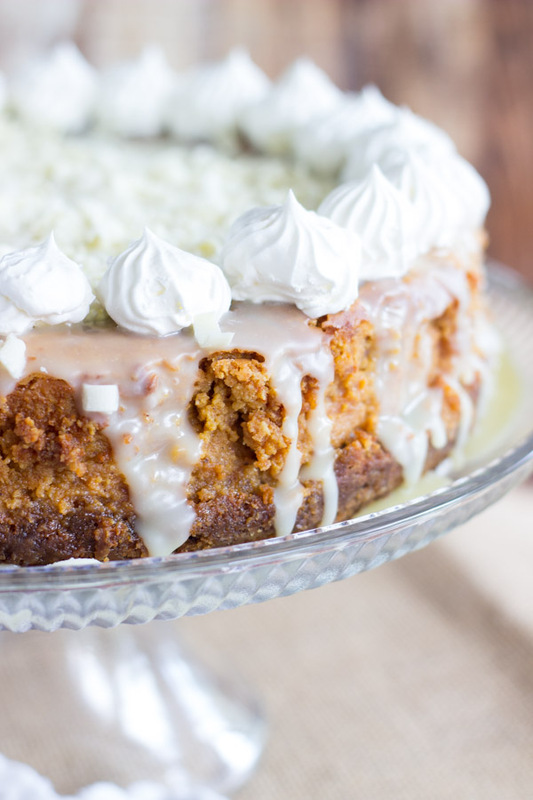 Finally, a Cinnamon Roll Pumpkin Cheesecake – the crust is made with cinnamon rolls! 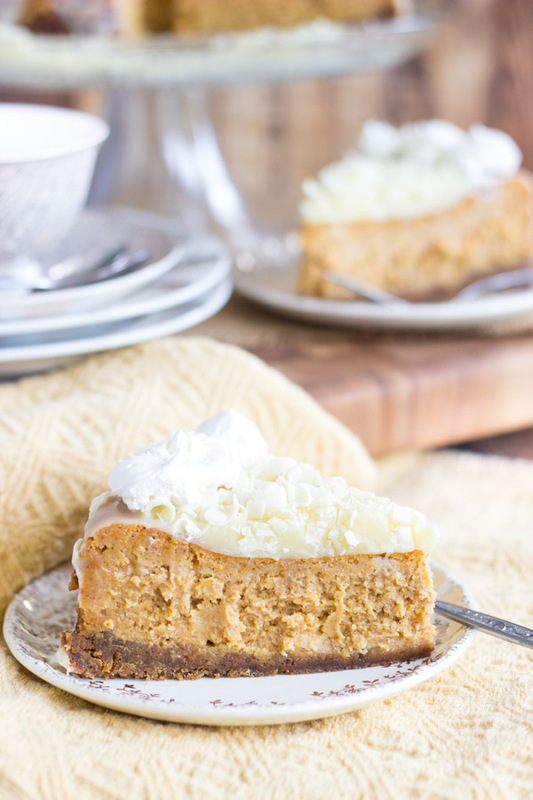 Now we have this White Chocolate Pumpkin Cheesecake with Gingersnap Crust, and it’s a gem too. I love that white chocolate enhances pumpkin desserts, and makes them more decadent, without detracting from the pumpkin flavor. Regular chocolate can drown out flavors sometimes, but white chocolate doesn’t do that. It’s my favorite cheesecake base – always creamy and rich, and completely reliable. It turns out every time, and it’s pretty damn easy. This cheesecake is loaded with spice, lots of pumpkin, and melted white chocolate is right in the batter. It’s topped with white chocolate ganache. That layer is my favorite part of this dessert, by far. It just completes the whole experience. The buttery gingersnap crust provides extra spice and flavor. 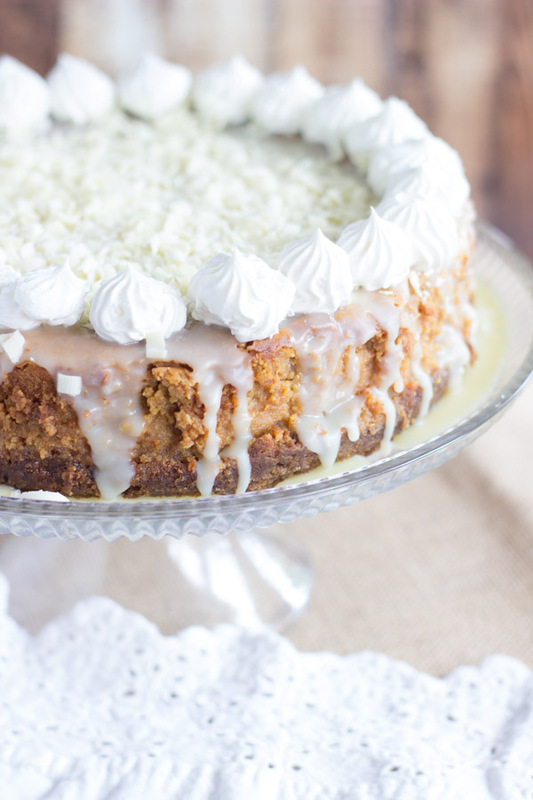 I don’t want to out-do my OG Double Layer Pumpkin Cheesecake with this White Chocolate Pumpkin Cheesecake, but it does have serious competition now! 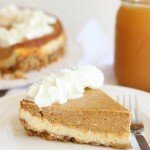 If you love fall cheesecakes, I have a few other FANTASTIC options. This Caramel Apple Crisp Cheesecake is out-of-this-world. I basically baked apple crisp right over cheesecake batter, and the result is unreal. For a few nutty options, I love this Maple Nut Cheesecake with Walnut Crust, and this Honey Pecan Cheesecake with Pecan Shortbread Crust. Both of those are *amazing*. 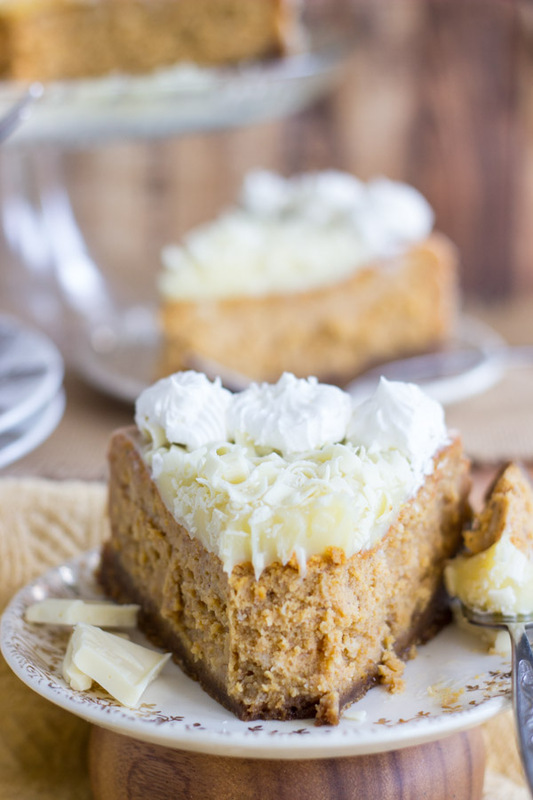 Perfectly rich and creamy spiced pumpkin cheesecake, infused with melted white chocolate, chock-full of white chocolate chips, and with a spicy gingersnap cookie crust! In a small bowl, combine gingersnap cookie crumbs, sugar, and butter. In a large mixing bowl, beat cream cheese til smooth. Add pumpkin, vanilla, and spices, beating until combined. With the mixer running on low, drizzle the 8 oz. melted white chocolate in a slow stream, until combined. Pour cheesecake batter over the crust. Bake at 350 degrees for about 60 minutes, or until the edges are golden, and the center is still slightly jiggly, but almost set. In a medium microwave-safe bowl, combine chocolate, heavy cream, and butter. Place in the refrigerator for 10-15 minutes to allow it to thicken slightly, before pouring it over the cooled cheesecake. Place in refrigerator to set. Top with chocolate curls. Cut and serve. So funny — I was looking at your photos first and thinking to myself, “HOW does she get the whipped cream and the topping to look so PRETTY?” I am NOT a baker, and I think this is gorgeous! But then I read your post and saw that you were not happy with the garnish because you were distracted by homemade croissants! Hah! I guess it’s all relative! I can assure you that I’ll never have homemade croissants baking in my oven while piping cream on a homemade cheesecake. LOL. You’re amazing! Fantastic! I so need this in my belly! This is making my mouth water! Looks so delish. Pinned! This sounds so heavenly! 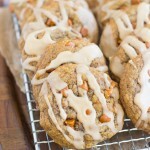 Totally made the Christmas dessert list! Thanks! Sarah, Do you have a favorite canned pumpkin puree? I did not do the whipped cream or chocolate curls though…it was still pretty with just the ganache and nobody knew the difference. I already had a request to make it again for Christmas!? YES!!!! That’s awesome – I’m so glad you all liked it!! Thanks for letting me know! I love when people report back about how the recipe went. I hope you had a perfect Thanksgiving!! Thank you! Oh and my sisters father in law said it was the best cheesecake he’s EVER eaten and another guest texted me today saying she’s been telling everyone about it☺️ I’d say this recipe is a keeper! Good job! I think you are right – I think I used a 9-inch. I just checked my pans. I’m going to make that change. It probably would’ve fit, but taken a lot longer to bake, what do you think? Thank you for your comment and for the feedback!! I LOVE the sound of the whipped cream… amazing! Happy Thanksgiving! Okay, good to know. I’ll change the instructions. Thank you so much! Happy Thanksgiving!